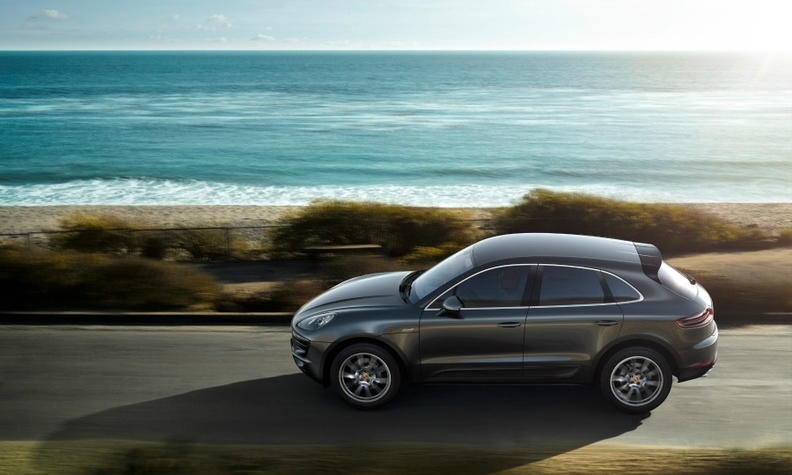 Porsche is prepared to boost annual Macan production should demand outstrip supply. FRANKFURT (Bloomberg) -- Porsche CEO Matthias Mueller said the automaker will exceed 200,000 in annual deliveries in 2015, three years earlier than first targeted, on demand for the Macan compact SUV. "We're transferring the genes of the Porsche brand into a new market segment," Mueller said in a speech today to mark the start of Macan production in Leipzig, Germany. "Porsche will remain a manufacturer of very exclusive premium cars." Mueller said Porsche is prepared to boost annual Macan production beyond the 50,000 currently being planned should demand outstrip supply. The model will go on sale on April 5 in Germany. At a starting price of 57,930 euros for the 340-hp Macan S version, it's about 25 percent cheaper than a comparably equipped Cayenne SUV. Vying for customers with the top versions of the BMW X3, Mercedes GLK and the Range Rover Evoque, the compact model will probably emerge as Porsche's most popular model next year. SUVs are due to account for a majority of Porsche sales, according to IHS Automotive estimates. "It's probably the right car for the right time," said Ian Fletcher, a London-based IHS analyst. Porsche may already pass the 200,000 mark this year on sales of more than 45,000 Macans, Fletcher estimated. Porsche, owned by Volkswagen, expects robust growth in premium SUV sales in the next decade and is considering a GTS performance version of the Macan, Mueller said. "GTS versions have a tradition at Porsche," Mueller said. "We haven't made a final decision yet regarding the Macan, but I'm sure it makes a lot of sense." Together with the Cayenne, which is 165mm (6.5 inches) longer than the Macan and the brand's current best seller, SUVs are forecast to account for 64 percent of Porsche sales next year, while the share of sports cars will drop to 24 percent of deliveries, according to IHS. Sports cars accounted for the majority of Porsche sales before the introduction of the Panamera four-door coupe in 2009. Porsche unveiled its $845,000 918 Spyder hybrid at the Frankfurt auto show in September. The supercar can reach 100 kph (62mph) in 2.8 seconds and gets the equivalent of about 3.9 liters/100km (72 mpg UK/60 mpg U.S.), based on European fuel-economy data. That tops the 5.6 liters/100km (50 mpg UK/41 mpg U.S.) of the basic Toyota Prius hybrid. "Cars like the 918 help Porsche maintain its edge as a sports-car maker while pursuing further expansion in the SUV segment with the Macan," Frank Schwope, a Hannover-based analyst at NordLB, said. Porsche's deliveries rose 15 percent to a record 162,145 vehicles in 2013 as demand for the Boxster and Cayman models more than doubled. Monthly sales growth slowed to 1 percent in January. Demand is set to gain traction in the second half as Porsche adds the Macan to its line-up. "There will be some cannibalizing effects on the Cayenne, because the Macan's price tag is more accessible and it's more practical in traffic due to its compact size," Schwope said. Mueller said between 10 percent and 20 percent of current Cayenne buyers might switch to the Macan. Mueller raised the possibility in 2012 of adding a $250,000 sports car to challenge Fiat Group's Ferrari brand once the Macan enters the Porsche lineup. An initial decision on a new model line could be made by the middle of this year, he said. "We've got a number of different options and proposals to choose from," Mueller added.